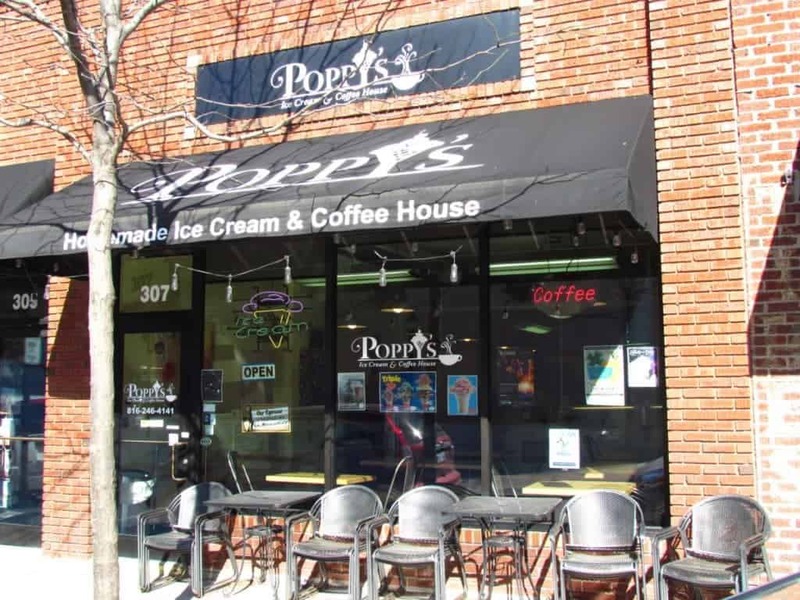 Poppy’s Ice Cream & Coffee House is located at 307 SE Douglas in downtown Lee’s Summit. It was a welcome sight during our recent visit. For us, one of life’s sweetest treats is ice cream. Give us a warm day, and a bowl of ice cream, and we are just about as happy as we can get. When we happen upon an ice cream shop we have never visited, we just have to stop in to see what they offer. The variety of colors swirled in the different containers are mesmerizing, and we find ourselves drawn to test a few. 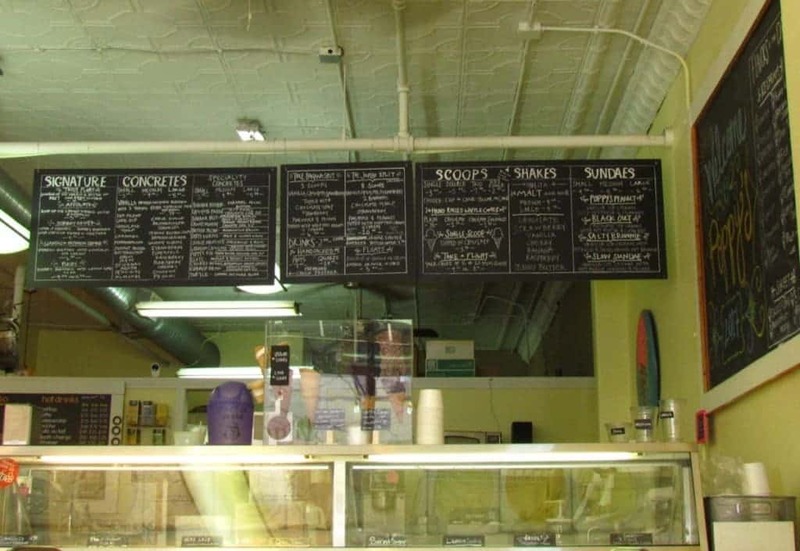 Poppy’s Ice Cream sits just off of the main drag, which is 3rd Street. The steady stream of people with ice cream cones treats highlighted the existence of a shop. It was not difficult to follow the trail to the door. In front of the shop they have a few chairs and tables for customers wishing to enjoy a sunny day. During our visit there was a little nip in the air, so we decided to partake of our purchases indoors. We had planned to visit them later in the evening, but I wanted to get some daylight photos. It also gave me a chance to scope out the variety of sweets they carry. While I clicked away with the camera, Crystal ordered up a hot beverage to keep her fingers warm while we toured the downtown. We walked away knowing that within a few short hours we would be tasting their frosty offerings. We returned to Poppy’s Ice Cream later in the evening to claim our self-promised rewards. While looking around, I took note of the building interior. Like some of the other buildings in the area, this appears to be an older industrial shop that has been renovated into retail use. The excessively high ceiling is covered in ornate pressed tin tiles. Exposed brick, pipes, and duct-work add to the age-old industrial feel. It certainly gives the place an old-time vibe. Before settling down to a bowl of ice cream, we first like to explore any other options. We noticed a glass display case on the side, and found it contained an assortment of candy treats. These are brought in from Chip’s Chocolate Factory, which is one of our favorite stores in Crown Center. Since we have sampled their wares on multiple occasions, we decided to focus this visit on the colder sweets. In the Poppy’s freezer cabinet, we discovered eight flavors of ice cream, and four of sorbet. The flavors rotate, and all are homemade. The menu allows customers to order a variety of frosty delights. These include concretes, shakes, sundaes, and scoops. 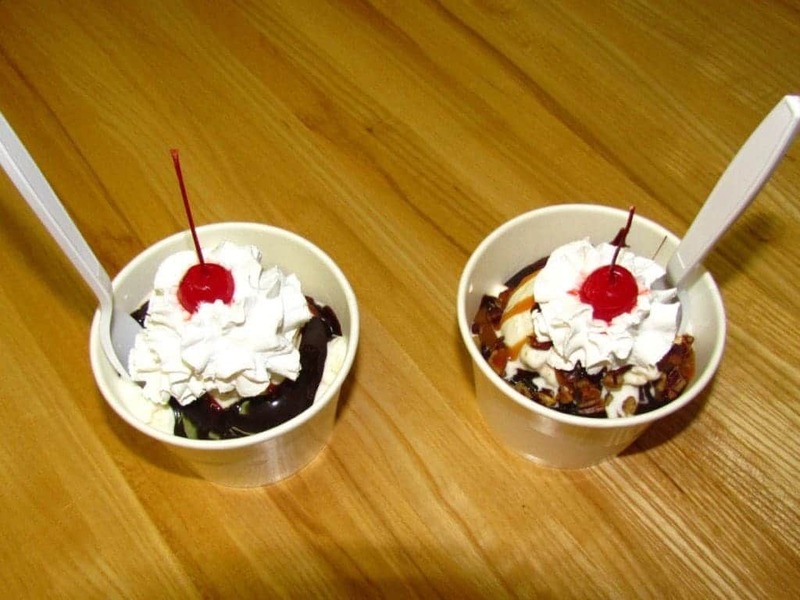 Banana splits come in normal size, and a special Jungle Split version with eight scoops of ice cream. Talk about the potential for brain freeze. 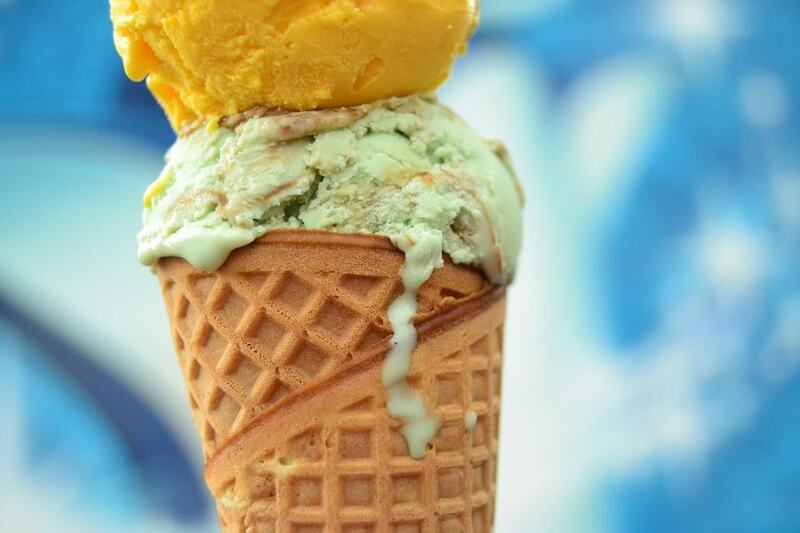 Scoops can come served in bowls or hand rolled waffle cones. The cones can be dipped in chocolate, and topped with sprinkles. For what I thought would just be an ice cream shop, this place takes customer choice to the max. We taste tested a few of the flavors that they had in stock, before finally deciding on our desserts. We were able to speak with the owner, and discovered that Poppy’s Ice Cream is served in quite a few restaurants in the Kansas City metro. Some of these include; Michael Forbes, Blue Koi, Grand Street Cafe, and Pierpont’s. Since our trip included a myriad of dining and drinking places, we decided to go easy, and just ordered a couple of small sundaes. One was a Slow Sundae, which is topped with hot fudge, caramel, and pecans. The other was a Salty Brownie, which duplicates the other except for the addition of salty caramel. The other difference is that it all rests on top of a delicious brownie. The quality of these treats was superb, and we quickly realized why so many fine dining establishments have sought them out as a supplier. 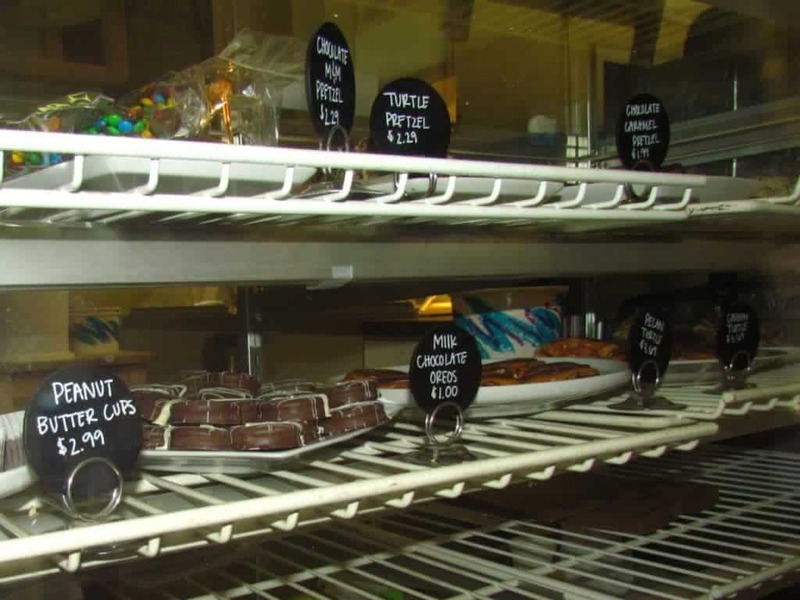 We now have a go to sweets shop whenever we visit downtown Lee’s Summit.